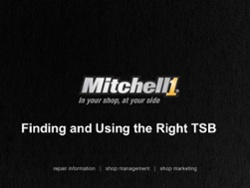 Mitchell 1 has announced that with the next release of TruckSeries, the truck repair software suite will be enhanced with the addition of the 1Search™ Plus advanced search engine and user interface. The 1Search Plus interface streamlines the vehicle technician’s job with an easy-to-use graphical design and consolidated information to help them work more efficiently. The advanced search technology scans the vast database of Mitchell 1 content and returns only the specific information the technician needs to make the necessary diagnosis and repair. All information relevant to the selected vehicle is assembled and delivered in a single location without any unnecessary and time-consuming navigation. Finding – and using – the right TSB starts with understanding what a TSB is and isn’t. That and more is covered in this new video.